DALLAS – The Thunder set an Oklahoma City-era record for offensive rebounds on Saturday night against the Dallas Mavericks with 26. Unfortunately, the reason was that there were a lot of available missed shots. 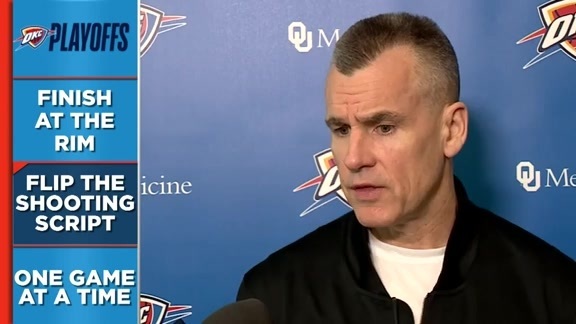 Head Coach Billy Donovan’s club was able to rack up 26 loose offensive boards because on the night the Thunder missed 59 of its 97 shot attempts for just 39.7 percent. Despite attempting 20 more field goals than the Mavericks, the Thunder made five fewer, and saw its seven-game winning streak snapped with a 111-96 loss. In this miss or make NBA, sometimes the shooting differences are the most glaring, and the most important factor in the game. Simply put, the Mavericks made the open looks they got while the Thunder didn’t. Dallas shot 55.8 percent from the field, including an incredible 14-of-29 (48.3 percent) from the three-point arc. “They hit shots and we missed shots. Sometimes the ball just doesn’t go in the basket for you,” quipped veteran guard Raymond Felton. That declared, the Thunder knows that the only way forward towards eventual improvement is to focus on what it could do better, and control its own decisions, lapses and missteps. For example, there were times during this one where the Thunder’s offense certainly could have helped out its defense. For the game, the Thunder shot 17 non-paint two-point jumpers, including 11 over the opening quarter and a half. Those inefficient looks set an early tone that allowed Dallas to snag rebounds and flow into offense. Eventually, Thunder misses and high percentage offense for Dallas exploded into a 33-8 stretch for the Mavericks that spanned the end of the first quarter and deep into the second period. With the Thunder truly on the ropes, down 24, Paul George sprung into action and helped his squad fight back. PG leads comeback. 12-0 run to close out first half. 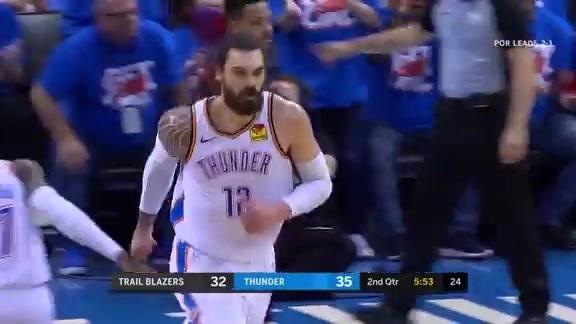 George finished a hustle play under the basket, chipping in two of the Thunder’s 24 second chance points in the game, then found Steven Adams on a cut to the rim before burying a three-pointer to close out a 12-0 run and make it a respectable margin going into the break. Outside of that burst, the Thunder’s offense just couldn’t get the mojo going. All season long, the Thunder’s two staples have been third quarter success (outscoring opponents by 4.8 points, at the very top of the NBA) and turning opponents over more frequently than giving it away itself. Tonight neither of those two situations truly materialized. Through smoking hot three-point shooting and downhill dribble drives from JJ Barea and Devin Harris, the Mavericks were able to get what they wanted without much resistance. “(Barea) got in there, and he’s one of those guys who, although he doesn’t have great size, is crafty with how he can finish and made some nice plays. He really carried them offensively,” said Donovan of the Mavericks reserve point guard who scored 21 of Dallas’ 53 bench points. Though the Thunder eventually turned the Mavericks over 16 times, the team wasn’t able to finish off those giveaways with meaningful or timely scoring, and on the other end the Thunder coughed it up just as many times. As for the third period, the Mavericks delivered the first punch, denying any semblance of momentum that 12-0 push before the break had given the Thunder. Back on its heels, the Thunder had an uphill climb the rest of regulation, though it did eventually cut the lead down to nine points by relentlessly attacking the backboard, racking up a 53-38 rebounding edge in the game. 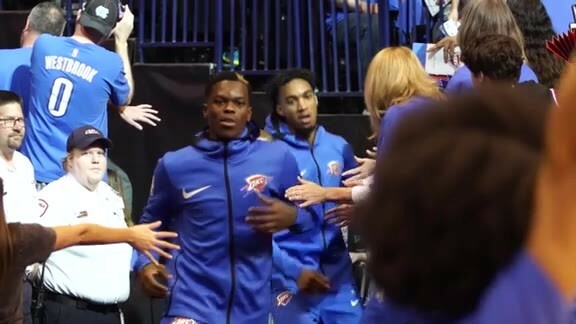 Without the finishing to go with it, and some prolific shooting from Dallas, the Thunder’s comeback hopes sputtered, and the team returns to Oklahoma City for a two-game home stand. That begins on Monday, when Donovan’s club hopes for another win streak to spring anew. “It’s one game. We’re playing good basketball,” said George. “Tonight wasn’t our night, but it doesn’t take away the games that we’ve had over the whole course of the last eight games.